Every classroom should have a U.S. Flag. This fully printed banner is made of Endura-Gloss™, a luxurious silk-like material and is carefully hem-stitched on all four sides. Mounted on black wood staff complete with gold spear ends and gold tasseled hanging cord. View larger image here. Also available with Gold Fringe (not pictured). Select size and type here. Facilitate hands on learning with our Endura-Gloss™ Mounted Flags with Gold Spears. Flags can be removed from base for classroom pass-around. Beautifully printed on luxurious silk-like material, these flags offer the highest quality in a mounted flag. 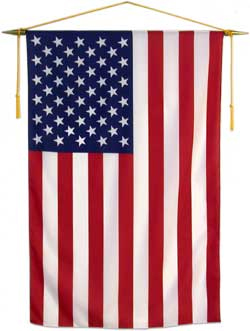 Our 4" x 6" Historical Desk Flags are carefully hem-stitched on all four sides providing longer lasting beauty. Supplied on 3/16" x 10" black plastic staff. Historical Flag Set #2< includes the following Flags: BENNINGTON, BETSY ROSS, BRITISH RED ENSIGN, BRITISH UNION, CONTINENTAL, CROSS OF ST. GEORGE, GADSDEN, GRAND UNION, U.S. 15-STAR, U.S. 50-STAR with solid black wood base. Historical Flag Set #3 includes the following Flags: BENNINGTON, BETSY ROSS, CONTINENTAL, GADSDEN, U.S. 15-STAR with black plastic base. Historical Flag Set #4 includes the following Flags: BUNKER HILL , 1ST NAVY JACK, PINE TREE, SERAPIS, TAUNTON and black plastic base. Pay us securely with these major credit cards or through PayPal!